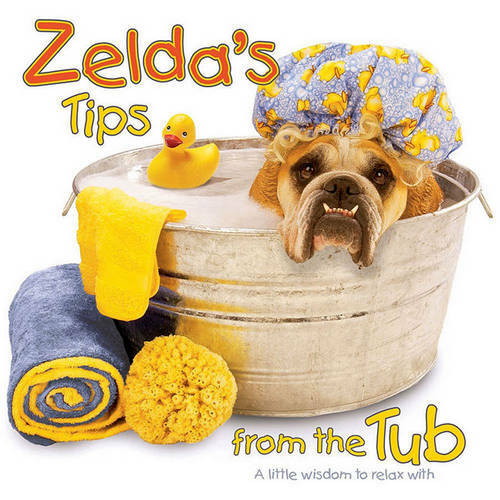 With Zelda's previous four books selling over 200,000 copies, "Zelda's Tips from the Tub" is sure to become another best-seller.Settle down with "Zelda's Tips from the Tub" for a nice long bubble bath to escape the pressures of everyday life. As you relax and unwind, you can absorb the wisdom of Zelda, chuckle, reflect, chuckle some more, and resolve issues. As Zelda puts it, "Even good girls get dirty sometimes. Zelda is a new breed of supermodel. Her measurements are 32-32-32. Her wisdom allows us to laugh at ourselves when we take life too seriously. And her popularity is growing! She's been featured in the "New York Times," and "Ladies' Home Journal, Good Morning America," and even Oprah Winfrey have all raved about her. She even received an honorary "Pet" degree from Harvard. "Zelda's Tips from the Tub" is the fifth book from this sixty-pound wise and witty bulldog. Her newest volume is all about taking time out (albeit not much) and coming away with a new and refreshed attitude. So sit back, relax, put your feet up, and enjoy-just don't drink the bathwater!